Something I’ve taken to doing lately is scouring the internet for interesting gambling studies, and another one pinged the radar today. 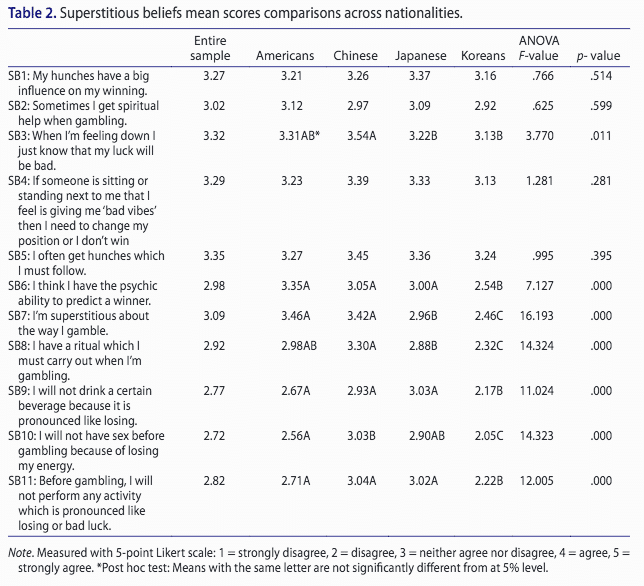 This particular study was published in International Gambling Studies earlier this year and it discusses the gambling motivations and superstitions of gamblers from the United States, South Korea, China and Japan. More specifically, the study notes what drives gamblers to play and what casinos can do to cater to customers of different nationalities. For example, we know here in the West that people can be pretty superstitions regarding the number 13. The number is so associated with bad luck that a large number of Vegas casinos skip the floor entirely. Check the elevator of any Vegas casino and there’s a good chance you will see no option to visit the 13th floor. They often number the floors to go straight from 12 to 14. The big Western gambling brands (think William Hill) have firmly established themselves in the European countries and some are now looking East. We’ve all heard for years that the Asian market is ripe with potential. Note that In 2014, Macau’s gambling industry dwarfed the total Las Vegas gambling industry by a factor of seven. Operators in the West, both online and land-based, are well-acquainted with the various superstitions and oddities that make Westerners unique. Some are familiar with the basic Asian tendencies such as choosing the colour red for good luck, but there is still a lot of work to be done in fully understanding what motivates gamblers of specific nationalities. The study discussed today was conducted by researchers at a land-based casino located in South Korea. 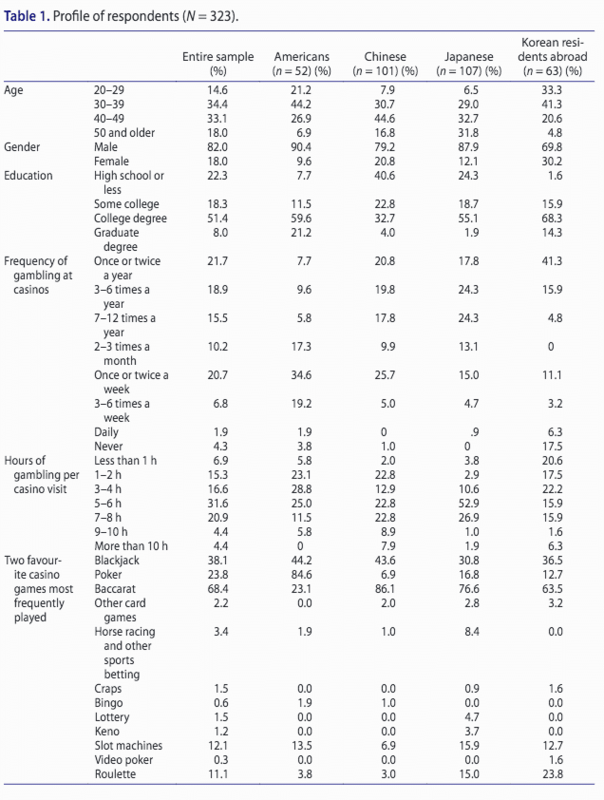 Researchers went to the casino and specifically targeted American, Chinese, Japanese and Korean gamblers for a series of questions to find out what makes them tick as gamblers. It may also be worth noting that South Korean casinos are restricted to foreigners only (residents cannot play), so the Korean gamblers were those who now live abroad. Researchers chose to do their work in a South Korean casino as they believe the country is prime for an uptick in gambling activity. The gambling market in South Korea is still relatively small in comparison to other gambling destinations due to restrictions on locals visiting casinos. Moreover, the majority of brick-and-mortar casinos earn most of their revenue from actual casino games. However, researchers believe the South Korean gambling market is prime for growth thanks to the government’s efforts to ease up visa requirements for Chinese visitors, an increase in overall Chinese wealth and the proximity of South Korean airports major Chinese cities such as Shanghai and Beijing. Furthermore, there are plans to build at lease one major resort that will be able to cater to both international visitors and locals along with an integrated casino for visitors only. With that in mind, the people who conducted this study chose to focus on a particular casino in South Korea. They believe that if the industry does grow, competition will increase and operators will be smart to gain a better understanding of the superstitions and motives of gamblers from the United States, Japan, China and Koreans who live abroad. Researchers spoke to a total of 323 patrons in the lounge area on the casino floor. They specifically chose patrons from the United States, Japan, China and Koreans living abroad in order to focus on the nationalities that contribute the most to South Korea’s casino industry. Americans consisted of 16.1% of respondents, Chinese 31.3%, Japanese 33.1% and Koreans living abroad 19.5%. Although this study and these recommendations come from a brick-and-mortar perspective, it’s easy to imagine how online casino sites could also tailor their offerings to customers from the Asian region. Understanding how players think and what motivates them to gamble could be hugely advantageous to companies that wish to make a serious push into the Asian market.